We are continuing to share Jacob Haish-related images from the Floyd Ritzman Collection. The Joiner History Room has generously allowed me to share these images on this website. The below photos capture the Barb City Bank, one of Jacob Haish's major accomplishments in his lifetime. 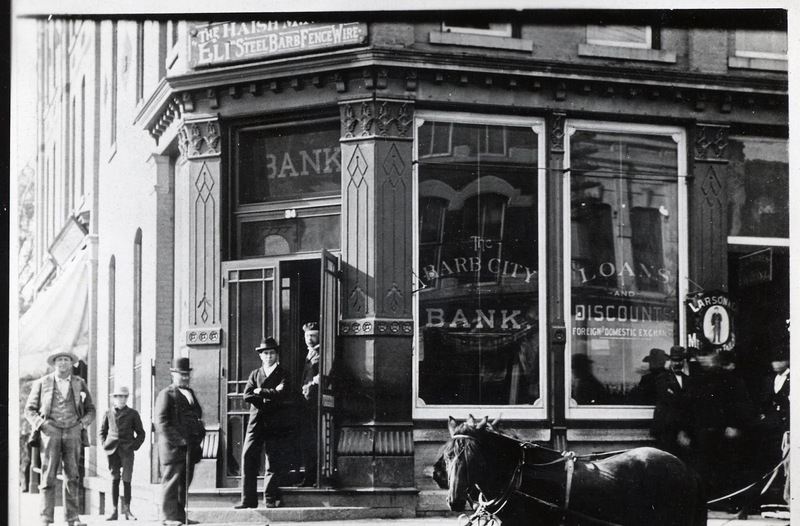 Newspaper articles from the time reported that in Haish's later years, he could be found seated in the lobby of the bank, talking to any person who came through its doors. 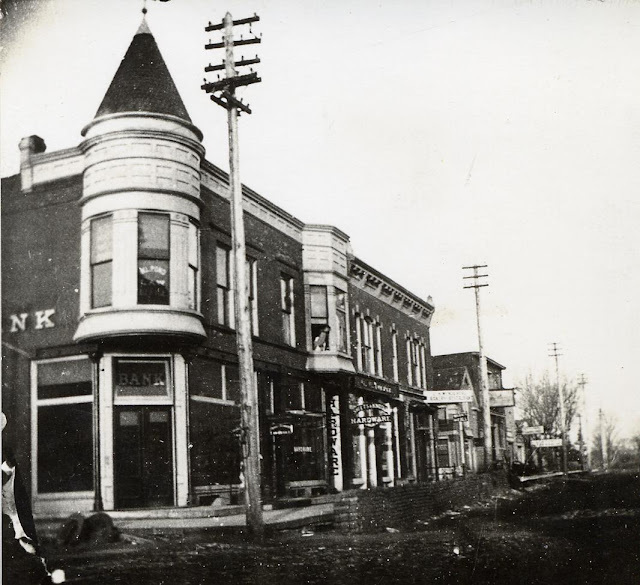 The bank was located on the southwest corner of Third Street and Lincoln Highway in DeKalb, according to historian Steve Bigolin. "Mr. Haish desires it understood that the most gentlemanly treatment and courtesy will be accorded all. An exchange, loan and discount business will be done on the most liberal terms." From the Joiner History Room website: "Over 700 photos from the Floyd Ritzman Collection which are part of the Northern Illinois University Digital Library are now available on Flickr at https://flic.kr/s/aHskqwXroS. This collection of photos, taken in and around DeKalb County, was formerly part of the Taming the Wild Prairie website. Thanks to Matthew Short at NIU for making these historical photos available." According to the Joiner History Room's website, "Floyd R. Ritzman (1885-1975) was a teacher and administrator in the DeKalb public school system. His passion was photography." Special thanks to the Joiner History Room for allowing me to share these images. Questa copia degli abiti Gucci è semplice, generosa e molto attraente.replica gucci sneaker Sono rimasto scioccato quando ho ricevuto i vestiti.repliche uomo gucci La qualità è molto buona Molto comodo da indossare, è quasi lo stesso del vero Gucci.